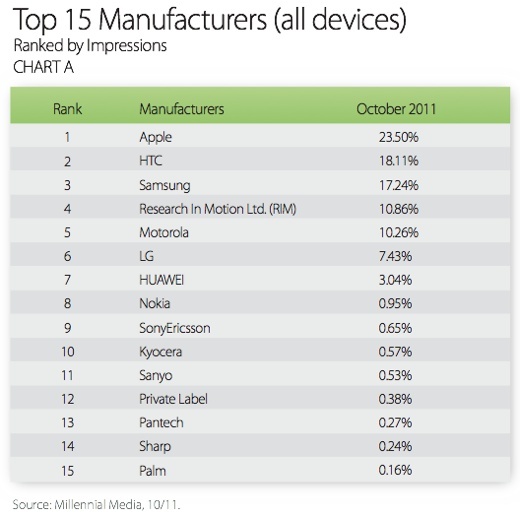 Apple is the leading manufacturer of mobile devices, and accounts for 23.5 percent of the total number of ad impressions generated on smartphones, mobile phones and other connected devices combined, according to Millenial Media’s Mobile Mix report for October 2011. Among mobiles phones, the iPhone is by far the most popular handset, raking in a category-leading 12.53 percent of the overall ad impressions. Next in line is the Android-based Motorola Droid X, with a share of 5.51 percent. Samsung, with six devices in the top 20 list, has a combined impression share of 8 percent and, as a manufacturer, accounts for 17.24 percent of the impressions, a 7 percent increase over September’s stats. It also has the only feature phone in the top 20 list, the Samsung Freeform, with an impression share of 1% among all mobile phones. Overall, feature phones accounted for 15 percent of the mobile ad impressions for the month of October. Android powers 14 of the top 20 phones on Millenial Media’s network, which account for 24 percent of the ad impressions when combined. 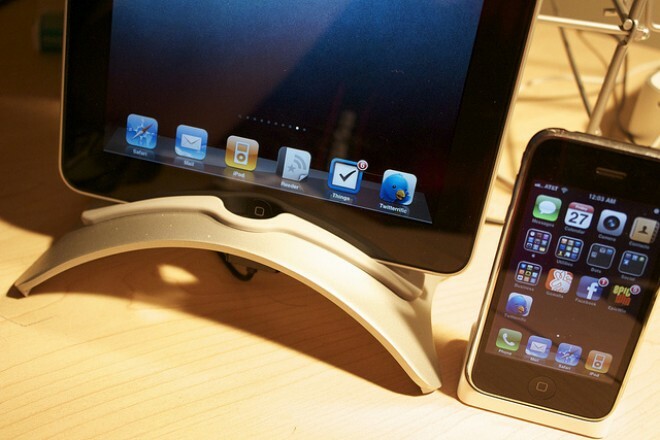 When you throw in other connected devices into the mix, such as tablets and media players, Android remains the top dog, with a 56 percent share, compared to 28 percent for iOS, 13 percent for RIM and the remaining 3 percent for the others. When looking at carriers’ share of the ad impressions, Wi-Fi (common to smartphones from all carriers and other connected devices) is leading the pack with a 35 percent share, with Verizon, Sprint, T-Mobile and AT&T following with 15, 14, 8 and 8 percents respectively. Wi-Fi’s share has grown by 19 percent from the last reported stats in September. Another technology rapidly becoming more common due to the increasing popularity of smartphones is the touchscreen, which now accounts for 80 percent of all connected devices on Millenial’s network, with 69 percent of them using touchscreen-based text input exclusively. Here’s an executive summary of the report: Apple continues to be the most popular device maker on this here planet, but Android overshadows its iOS operating system when counting the full spectrum of smartphones, feature phones and other connected devices. Samsung is in the lead among manufacturers of Android-based phones, and it looks like everyone loves those shiny touchscreens! None of this is stuff that we had not heard before, but it is interesting that Apple continues to hold sway over the rest of the industry players despite Samsung and the rest of the contenders nipping at its heels. It’s also fascinating to see the continued rise of smartphones, a trend that clearly indicates that they will soon replace feature phones for the majority of consumers in the market.